Revenue growth and profitability – are the two metrics the C-Suite cares about the most. They tell you exactly how you did this month or quarter. But do strong sales predict next quarter’s results? Hardly. What if the C-Suite had a crystal ball that could not only predict their growth and profitability, but give glimpses into the minds of their customers in time to save accounts that might otherwise go under? We haven’t really had that capability, until now. 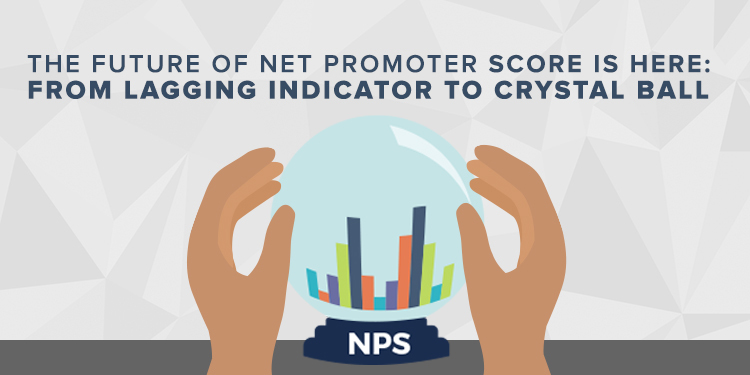 Traditionally, Net Promoter Score has been a “lagging indicator.” NPS surveys were typically sent out once a year, or once a quarter at most. There would be a big push to get the survey out, another push to respond, and then a mad dash of trying to piece together what happened during that time to result in the scores received. But modern NPS programs are different. They can be that crystal ball.